Simone sofa, Sputnik studio, design Homage to Nina Simone Elegant and flirty, Simone catches the attention of every person in the room, with its back suspended over the seat letting us see the beautiful gap between both parts and the golden metal bars that separate them. Its light structure, its sensual curves reminds us of the elegance of a grand piano. No wonder why it borrows its name from the outstanding singer and pianist Nina Simone. 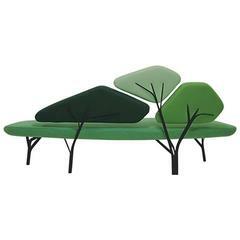 Dimensions: 95 x 182 x 76 cm Materials: Handmade, Pine wood structure reinforced with plywood. Seat polyurethane 3542. Backrest polyurethane HR22. Golden iron metallic parts. Beech wood legs. Sputnik is a multidisciplinary design studio based in Valencia (Spain). It was born motivated by a constant and restlessness desire to create innovative and functional products, providing each design with a different vision on everyday objects. 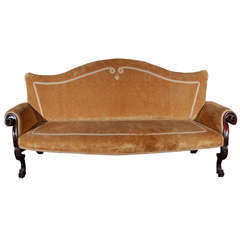 Italian sofa with scrolled arms, Rome, circa 1785. 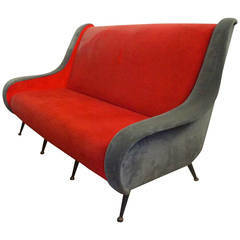 Curved vintage sofa, with six wood legs. 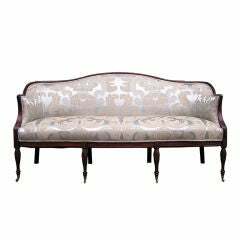 Hollywood Regency sofa or canapé with a pickled and carved wood frame with Louis XV style details. 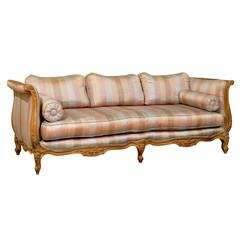 The sofa is upholstered in a striped silk with feather down cushions.